Located on the 60th storey of UOB Plaza, Si Chuan Dou Hua Restaurant offers great views of the city and serves delectable Sichuan and Cantonese cuisine in an elegant setting. The restaurant is a good place for business lunches as well as for romantic dinners. 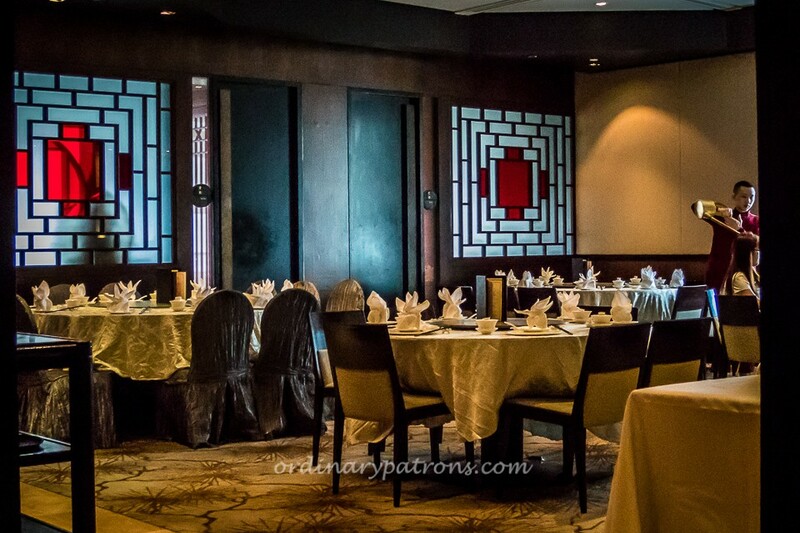 Many ordinary patrons go there because they like the restaurant’s fiery Sichuan dishes, vegetarian dishes, interesting desserts and dim sum items. Their specialties include Boiled Sliced Fish in Sichuan Pepper Sauce, Braised Pork Belly served in Whole Pumpkin, Diced Chicken with Dried Chilli and Lotus Root with Honey. We had lunch there and had a selection of dim sum items and soups. As soon as we were seated, we were offered tea which we accepted. That was the cue for the demonstration by the tea master who combined the skills of martial arts and dance in the art of tea-pouring with long-nosed bronze kettle. 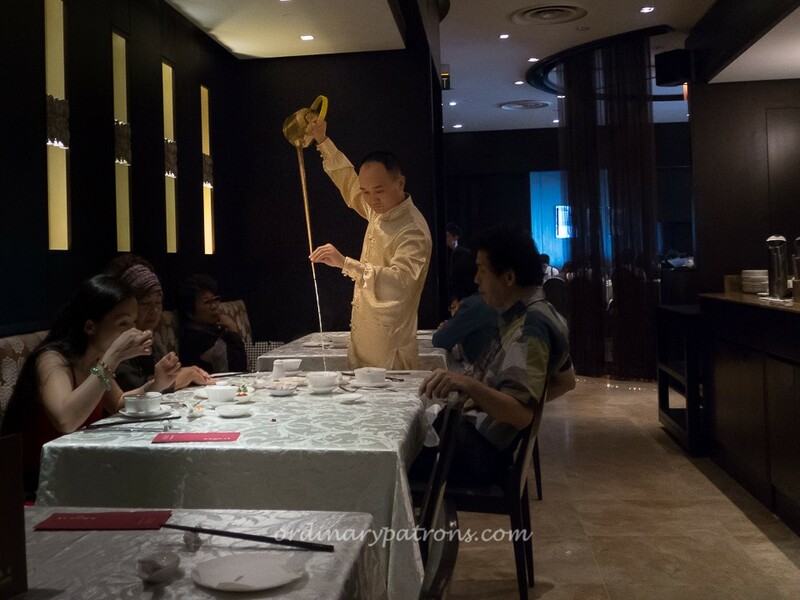 The act of tea-pouring in Si Chuan Dou Hua Restaurant is always a treat, no matter how many times we have seen it. We ordered the Winter Melon with Seafood Soup ($10) and Minced Meat Dumpling in Superior Stock ($5) to start the meal. 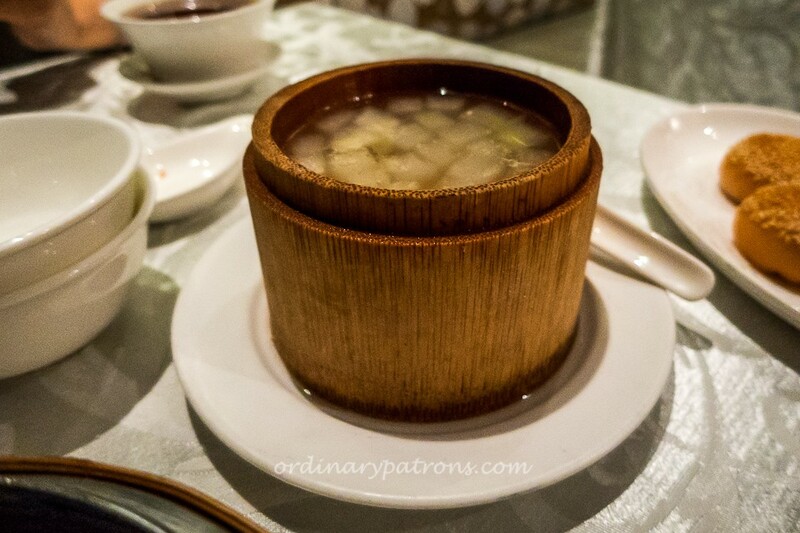 The Winter Melon soup came in a nice bamboo bowl. It was a mild soup full of ingredients and was most flavourful. 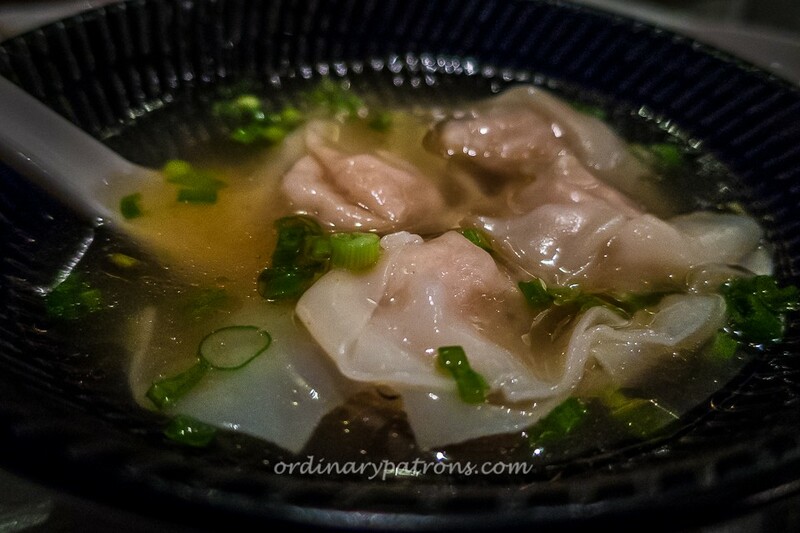 The meat dumplings were well made with skins of the right thickness and texture. 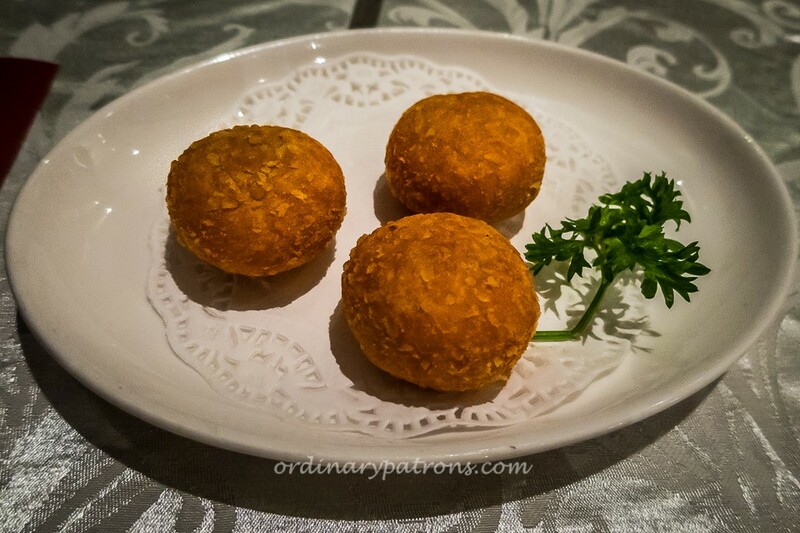 We did not have the usual dim sum staples but instead tried the more unusual items offered by Si Chuan Dou Hua Restaurant. We ordered the Pan-fried Bun with Meat Floss ($5), Steamed Glutinous Rice Roll with Minced Meat ($5) and Sweet Potato Pancake ($5). 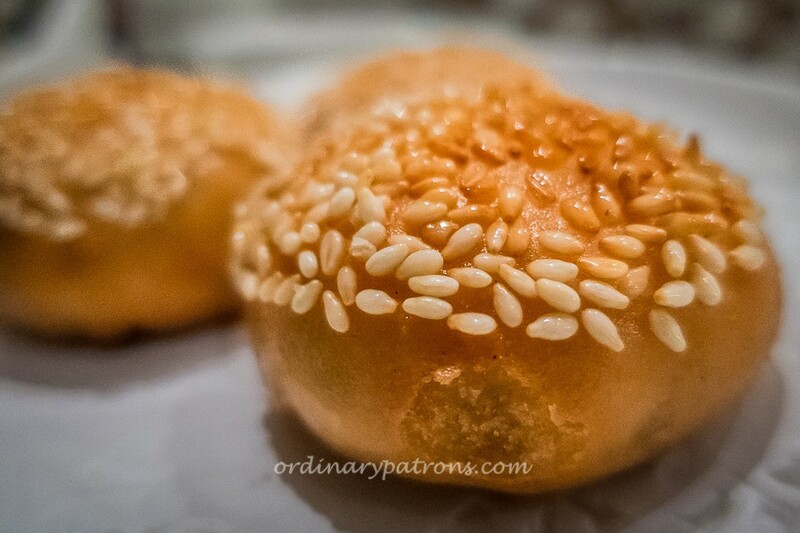 The Bun with Meat Floss was nicely fried so that there was a thin crispy outer layer which was topped with sesame seeds. There was a soft fluffy layer inside and the meat floss filling had a sweet pepperish taste. 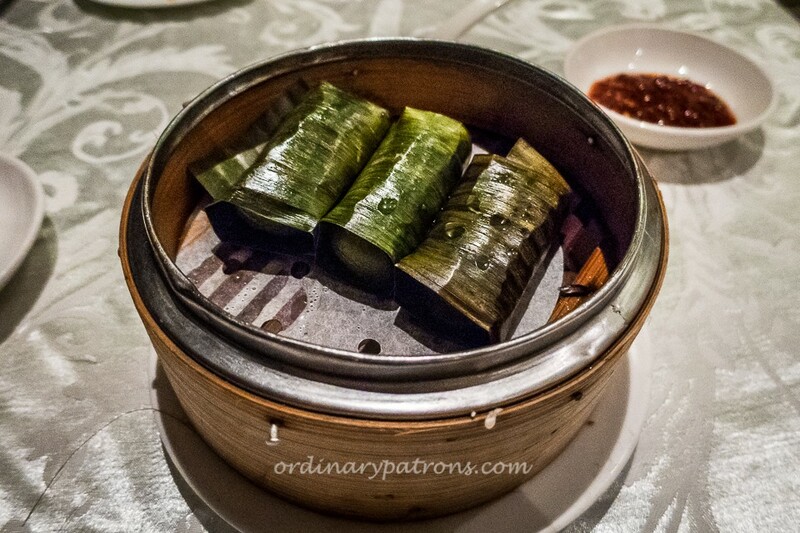 The ingredients combined well for a delectable dim sum. 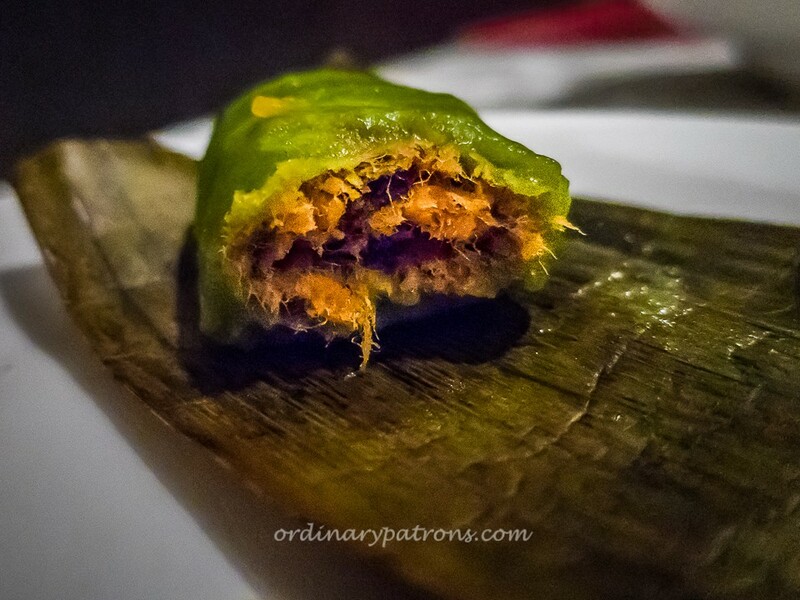 The Steamed Glutinous Rice Roll was interesting; it looked like a Nyonya kueh. The soft and slightly chewy glutinous rice skin went well with delicious filling of meat floss which were savoury with subtle sweetness. The Sweet Potato Pancake did not look very exciting. It was not flat like you would expect of a pancake and somehow reminded us of the deep-fried sweet potato ball from Maxwell Food Centre. The pancake was crispy on the outside and the sweet potato filling was a slightly sticky paste. It was quite enjoyable. 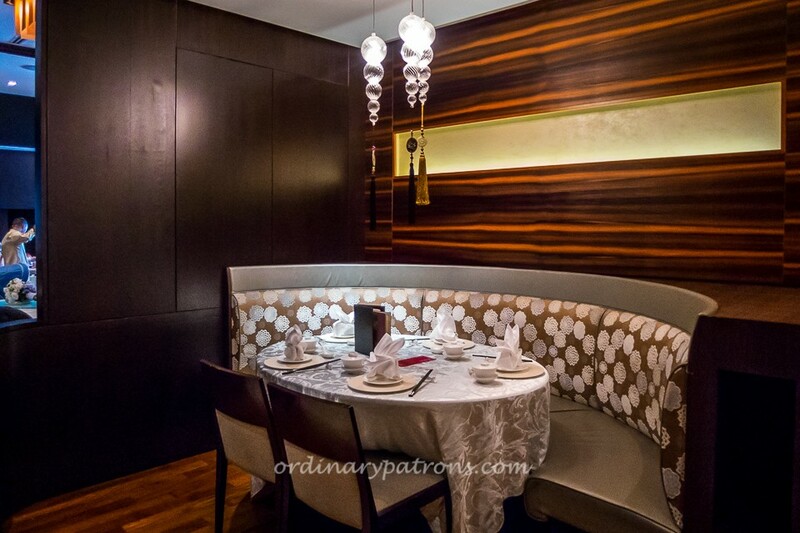 On the whole, Si Chuan Dou Hua at UOB Plaza is a very well-appointed restaurant serving food that is above average. It has an interesting menu. 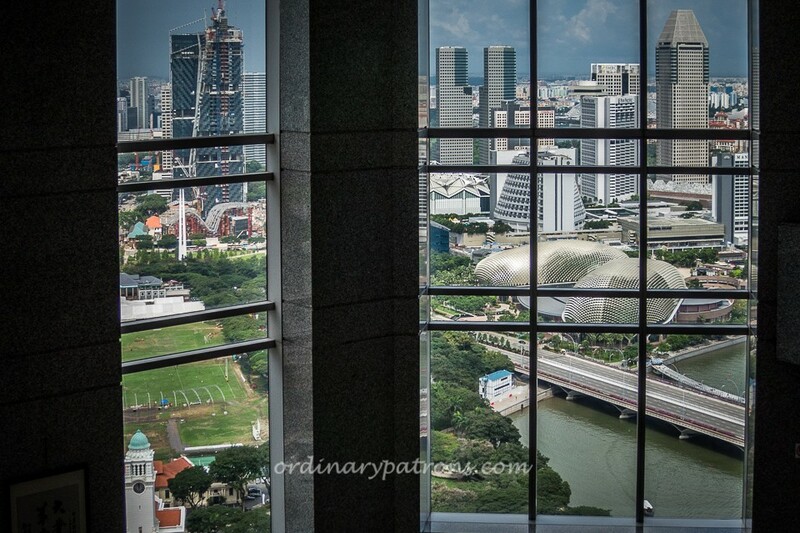 There are not many other Chinese restaurants in Singapore which could offer the spectacular views you get at the top of UOB Plaza. With their dim sum items priced mainly at $5 each, we think they offer excellent value considering the setting and the views. We have been to Si Chuan Dou Hua at UOB Plaza many times before and should be going there again. Horrible restaurant ! We went there on 1 May evening happen to join with 6 tables of tourist group . Food is tasteless! Service is slow! And unbearable noisy!! Never ever go back again! !